Mold is really a peculiar thing to many people. It’s fuzzy, colored, and off-putting appearance is enough to gross most people out but also peak their interest. As a result, there is a lot of different false and misleading information about mold. Here are a few facts about mold that we at Alert Disaster find interesting and can help you have a better understanding of mold. Mold doesn’t just grow out of thin air. It has to be in the right environment and needs food to thrive. The perfect environment for mold is damp, dark spaces, and it loves to feed on organic materials. If you have spaces in your home that meet these criteria, you are at risk of mold. On the other hand, if you prevent any parts of your home from becoming this type of environment, then you should be able to keep your home mold free! When most people think of mold, there are only a couple that typically comes to mind. We often think of black mold, which has a reputation for being toxic, and the mold we find on our old food in the refrigerator or on expired bread. However, there are so many more types of mold than the types we typically encounter. Fortunately, only about five of these 10,000 common species are typically found indoors. The standard homeowner’s insurance policy may or may not cover mold damage, depending on the cause of the mold problem. 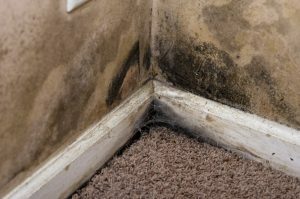 If mold results from a covered water loss, such as the sudden or accidental discharge or overflow of water or steam from the plumbing system or a household appliance, the cost of mold remediation will be covered under home insurance because the reason for the claim is the covered peril, not the mold itself. Some insurance policies, however, contain exclusions, specifying that they will not cover mold removal and remediation, regardless of the source of the problem. Most of the mold found in homes are dark and splotchy. This leads many people to think that mold is typically dark colored, but this is not the case. Mold can actually grow in a wide variety of colors including orange, green, and white. If you are unsure if what you are seeing is mold, contact a professional mold remediation company that can thoroughly inspect the area. Obviously, mold is something that should be considered hazardous to your health, but there are a few exceptions. The most popular among these exceptions is Penicillium. Penicillium is the active ingredient in the antibiotic penicillin because it naturally kills many different types of bacteria. While people often use the terms “mold” and “mildew” as synonyms, there are distinct differences between the two. The main distinction is that mildew can only grow on top of surfaces and cannot penetrate beneath surfaces to cause structural damage. Mold can, which makes it the much more dangerous of the two. Now that you know all these facts about mold, we at Alert Disaster in Bakersfield hope that you can use them to your benefit to keep mold out of your home for good!